Three ACT scholars were sponsored by the ACT Crawford Fund Committee to attend the 2017 Crawford Fund conference this year in Canberra. Scholarships are offered to young Australians with a genuine interest in international agricultural development to attend the conference. I am most fortunate to have been an ACT Crawford Scholar for this year’s conference, and to network with many other young and more experienced scientists working in international agricultural development. With the theme of “The Digital Revolution in Agriculture – Transforming Lives and Livelihoods”, the enormous potential for the digital agriculture data revolution to increase overall productivity and profitability of smallholder farms in the developing world was examined, through both case studies and panel discussion. In the opening session, the significance of smallholder farms in global food production was established, with the majority of world food production being produced from smallholdings. The barriers of smallholder farmers to useful data to manage their holdings were also explored. It seems there is still much capacity to increase the proportion of agricultural data digitised, relative to other sectors. Agricultural data that is collected, particularly in developing nations, tends to be fragmented, non-standardised, and inaccessible to those who need it to make critical decisions that will have a great impact on smallholding productivity and profitability (for instance, current and forecasted market prices at harvest). In later sessions, we saw innovations that had been developed, including the platform Digital Farmhand, which uses on-farm robotics to collect in-crop data via sensors, and the use of 3D barcodes to trace produce from point of harvest in rural Vietnam, through quality certification and to point of sale in urban areas. A case study in the application of “big data” that was of particular interest to me as a researcher in crop pre-breeding (and immediately applicable to my current project) was the use of climatic and other data for focused germplasm identification in breeding efforts. I noticed several recurring themes that surfaced throughout the conference. The first of these was of crop nutritional quality. It became clear through the talks and panel discussions that it is not sufficient to consider smallholder output purely in quantitative terms such as crop yields. It is equally important that harvests from smallholdings must either meet the nutritional demands of the farmers and their families, or provide sufficient profit margins to provide the purchasing power to enable them to meet these needs. A second theme that was discussed at length over the course of the conference was around data ownership, and the merits and limitations of both private and public/open source data. The third theme centred round mobile phone technologies, and their use as a form of infrastructure to deliver data to smallholders in a timely way. It is apparent that the use of apps has moved well beyond being just a trend, as the case study on the use of mobile technology as a tool for helping smallholder pastoralists make more informed decisions about drought risk and accessing livestock insurance in rural Kenya. 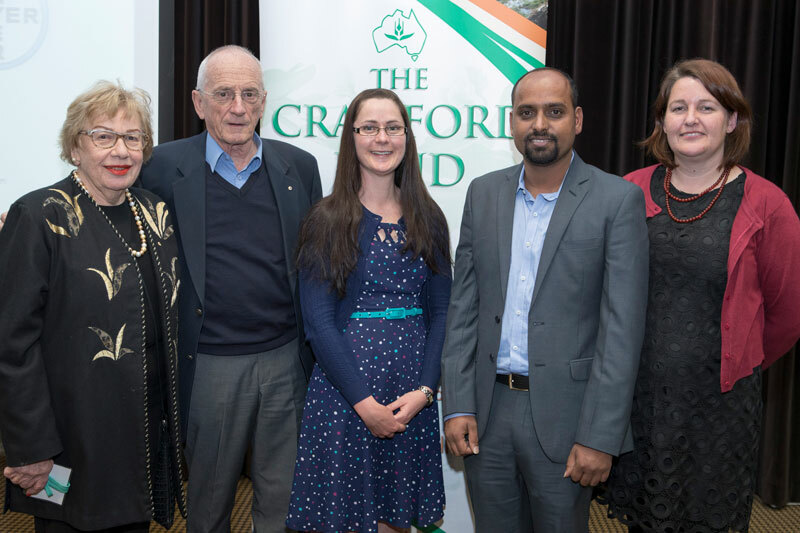 The one-day conference was bookended with two days of scholar day activities, which provided an excellent orientation to the work of the Crawford Fund, ACIAR, RAID and the community of international agricultural development researchers in Australia. For me personally, the most valuable part of the three days of activities were the discussions, introductions and insights into international agricultural development gained through interactions with my mentor. I also found the reflections and advice of scientists on their in-country experiences on past and current ACIAR projects to be of particular practical use, and an excellent session to ground scholars in the real-world potential and challenges in adopting new technologies (including digital ones) in developing world agricultural settings. Thank you to the Crawford Fund, its supporters, the speakers and mentors for enabling my involvement in this year’s conference – it has been an invaluable opportunity to learn, network and motivate myself to contribute in this field. We live in an incredible age of transformation –at both the digital and human interfaces of society. The power of this change, and how we can harness the knowledge available to us to deliver agriculturally-driven and scientifically/evidence-based benefits to those most at need, was abundantly apparent at this year’s annual Crawford Fund Conference – “Transforming Lives and Livelihoods: The Digital Revolution in Agriculture”. From the moment public proceedings began, with the Sir John Crawford Memorial Address “A New Narrative Ending Hunger”, delivered by Dr Lindiwe Majele Sibanda, the atmosphere was electric. It is rare at times to hear such an incredible and inspiring oration, which gently winds you through the comfort of a great story to the heart of an issue – it’s time for nutritionally sensitive agriculture. We were perhaps ignorant historically in our pursuit of quantity over quality, but we know better now and we surely have the capacity and the responsibility to change the face of agriculture to provide a foundation for the solution. It’s time for institutions to engage effectively with one another – across jurisdictional and spatial boundaries – to deliver on a promise of a healthier, happier, and more inclusive world with equitable access to nutritious and fulfilling food choices. The inspiration continued during the next day during formal conference proceedings, with sessions tackling issues of how big and small data can transform agriculture for the smallholder farmer, some of the key issues encountered when doing so, and how digital transformation and technologies are changing the face of agriculture in general. Encouraging access to sensible, useful and open data to share knowledge and drive innovation. Infrastructure is key to true market access. The success of agriculture is the sum of all of its parts. Digital agriculture platforms offer so much in this space – the possibilities are endless…. Bookending these incredible and inspiring proceedings was an equally incredible and inspiring Scholars’ Program. Each paired with a mentor with a wealth of experience in international agricultural development, with ample networking opportunities and informal and formal presentations of the possibilities and the pitfalls of working in the international agriculture space, I believe every single scholar had as fantastic a time as I did. With this new network and community of international agricultural development colleagues and mentors I look forward to forging ahead and contributing to international agricultural development in my future career – the challenges are great, but they are worthy, and if we put “farmers first” we can truly make a lasting difference together. First of all, I would like to thank the Crawford Fund for providing this great opportunity to participate in the conference focused on “Transforming Lives and Livelihoods: The Digital Revolution in Agriculture.” The experience and knowledge, gained from this event has given me the encouragement and confidence to work towards world food security. By attending this conference, I had the opportunity to meet world-renowned scientists in the field of agriculture. I was very impressed with the many innovative presentations during the conference on the uses of new and digital technologies to increase global food production to meet the food demand for the rising human population. The seminar by Dr Lindiwe Majele Sibanda on international networks and opportunities and Sir John Crawford Memorial Address followed by Prof Andrew Campbell’s talk was very impressive and motivating. Meeting with mentor, Dr Anthony Leddin was a great experience, and I am very much impressed by his valuable contribution to food security. His view and efforts to help farmers further stimulated a similar interest inside me. Meeting with other agriculture scientists, RAIDers, volunteers and ACIAR in the pearl of wisdom session was another excellent opportunity to discuss the future possibilities in the agriculture field. It gave me an opportunity to know about others’ work and their future ambitions and also, I got the chance to discuss my work and plans for the future. Suggestions from the mentors further encouraged my wish to carry out research in the field of agriculture for food security. The first day RAID networking dinner was a great avenue for scholar’s interactions with scientists, and leaders in the agriculture field. The second-day parliamentary conference enriched me with many fantastic presentations such as “Big Data for Genebank Mining” by Dr Ken Street which was fantastic and I was inspired as my work is also on exploring the sources of seedling stripe rust disease resistance genes from the landraces collected by Vavilov. I heard that the availability of data for the public will enable them to work efficiently without any barrier, and while lots of people in developing countries have talent, due to lack of resources and funds, they are unable to access the data available for research. Availability of data will solve the problem and progress their work to secure the production. Another seminar (case study) on “Digital Farmhand – data analytics and robotics for food and nutrition security” by Prof Salah Sukkarieh was also interesting for me. Participation in the career sessions on the last day encouraged me to participate in the programs related to agriculture and it highlighted the opportunities available. In summary, innovative and informative talks and networking sessions on food security issues made the conference fruitful.